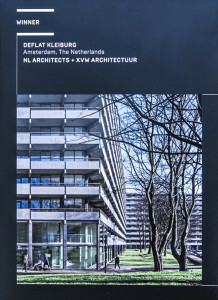 DeFlat Kleiburg in Amsterdam is the 2017 Winner of Prize. The architects are NL architects and XVW architectuur and the client Kondor WesselsVastgoed. DeFlat is an innovative renovation of one of the biggest apartment buildings in The Netherlands called Kleiburg, a bend slab with 500 apartments in Amsterdam’s Bijlmermeer neighbourhood. Consortium DeFlat rescued the building from the wrecking ball by turning it into a "Klusflat", meaning that the inhabitants renovate their apartments by themselves. The 2017 Emerging Architect Prize has been awarded to the Brussels studios MSA/V+ for the work NAVEZ - 5 social units at the northern entrance of Brussels, a housing project that fulfills the double ambition of the local authorities: to represent the urban revalidation scheme with a landmark at the entrance of the city and to provide exemplary apartments for large families. The client is the City of Schaerbeek.